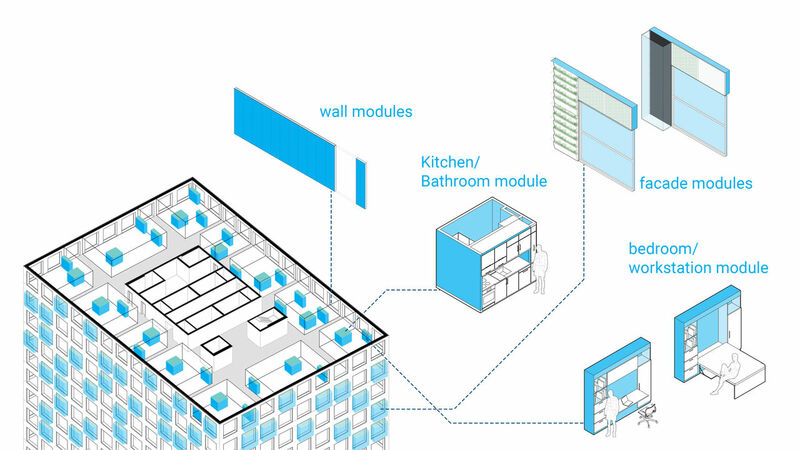 The MOR (Modular Office Renovation) team of the TU Delft, which consists of 54 students, is working on a design to renovate (a part of) an inefficient office into an apartment that produces more energy than it uses. On the 15th of January 2019, the team revealed the definitive design of this prototype. With the prototype, the team will travel to Hungary in July 2019 to participate in an international student competition for energy-efficient residences. "We see two major challenges within the built environment in the Netherlands, namely the large amount of inefficient offices and the high demand for affordable housing for starters," explains Siem van Sluijs, partnerships manager of the MOR-team and student Building Technology. "Approximately 55% of all offices in the Netherlands have an energy label lower than C and therefore have a poor performance. Due to a recent change in regulations, offices with an energy label lower than C are prohibited from 2023 onwards. In addition, one million homes will have to be built before 2030. Our design could help with tackling these two challenges ", says Van Sluijs. The design is based on a modular and 'net positive' apartment. "With net positive we mean that the building, for example, produces more energy than it uses. In addition, the air entering the building is filtered, this creates a healthy indoor climate and food can be grown within the tower " explains Van Sluijs. Within this net positivity, the MOR team focuses on five aspects: energy +, water +, air +, biomass + and materials +. The entire renovation of the office buildings is possible with four modules: facade module, bathroom/kitchen module, bed/desk module and wall module. This makes the renovation of the poorly performing offices accessible and affordable. In addition, the modules can easily be reused in other buildings. Because residents have individual requirements and wishes for their home, the modules can be placed by the residents in such a way that the home meets their requirements. For example, the apartment can be larger or smaller and an extra bedroom or bathroom can easily be added. This makes the design future-proof. The Solar Decathlon Europe 2019 (SDE19) is an international competition for universities from all over the world. The competition challenges student teams to design, build and operate a fully functioning house that is designed to the highest standards of sustainability and circularity. During the competition, each house is assessed on 10 criteria, including architecture, engineering & construction, energy efficiency and economic feasibility. In July 2019 the construction and judging of the houses takes place in Szentendre, Hungary. The MOR team represents the Netherlands in the Solar Decathlon Europe. The team consists of 54 students from the TU Delft with more than 20 different nationalities and 14 different disciplines. Buildings are currently huge consumers of energy and resources and the MOR team believes that this should be different. Van Sluijs: "In order to ensure that our future generations can flourish, we believe that buildings must turn into producers who give back more to their environment than they take away from it." 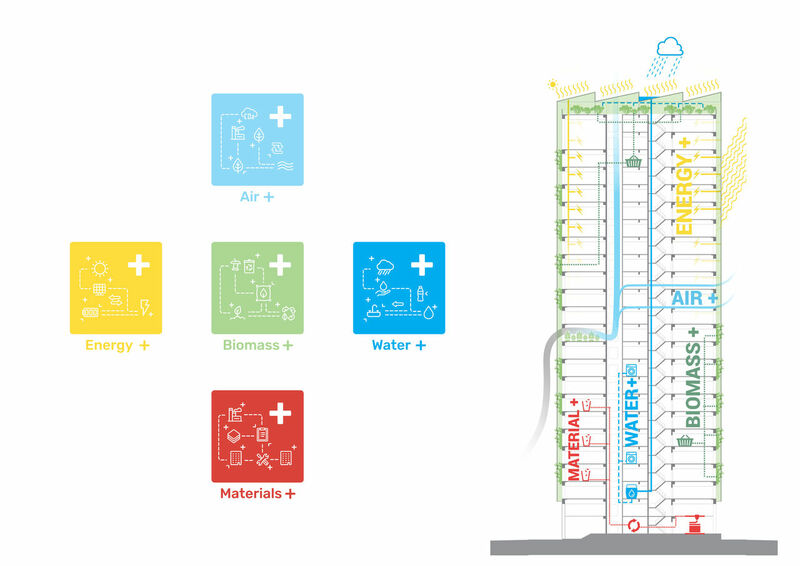 The team has an enormous passion to innovate and develop a strategy that prepares the built environment for 2050, when the built environment must be completely CO2 neutral and circular. Image use is possible with mention of TU Delft. More imagery is available on request.